Wire services reports of this game recorded it as a no-hitter, though both the home and away newspaper accounts disagree. Vic Willis is credited with throwing the second no-hitter for the Braves franchise 118 years ago today, although accounts in both the home and away newspapers recorded this game as a one-hitter. Willis, pitching for the National League’s Boston Beaneaters at the Huntington Avenue Grounds on Monday, August 7, 1899, no-hit the Washington Senators for a 7-1 win, according to the official no-hitter list. But The Washington Times had a different take, noting in its sub-headline: “Washington Secures Only One Little Scratch Hit of Willis. 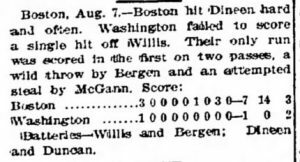 Box scores in both the Washington and Boston papers show one hit. But the wire service accounts and box scores that spread across the nation show the game as a no-hitter, and that’s how it stands in the MLB record books.